The upgraded MarinaGuard Series 2 ground fault protection panels from Bender Inc. protect against the danger of electric shock drowning and meet new regulations to safeguard people at marinas, boat yards and docking facilities across the United States and Canada. Thousands of people are at threat from the rarely recognized danger of electric shock drowning (ESD) when they enter a body of water that is exposed to an electrical fault. 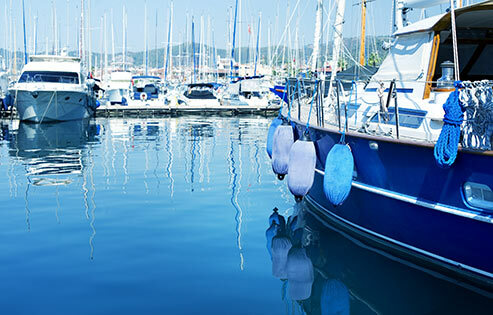 Updates to the United States National Electrical Code (NEC, NFPA 70) 2017 edition have significantly changed the ground-fault-protection requirements for “Marinas, Boatyards, and Commercial and Noncommercial Docking Facilities”. The detection maximum limit under the updated NEC Article 555.3 has been lowered from 100 mA to 30 mA. NEC 555.3 now requires ground-fault protection (i.e. : tripping) at the 30-mA level for all overcurrent devices supplying these facilities. In Canada, the Canadian Electrical Code (CEC, CSA C22.1) 2018 edition also requires 30 mA protection as described in Rule 78-052. Electric shock drowning occurs principally in freshwater environments, and the threat starts with an electrical fault condition on the dock or onboard a boat when a voltage source comes into contact with the body of water. The voltage creates an electric field that radiates throughout the water in a hemispherical shape – like ripples from a pebble thrown into the water. Electric current begins to flow through the swimmer’s body when they enter the electric field. The human body has a much lower resistance than fresh water, so it acts as a better conductor of electricity, and in the presence of an electric field, the person not the surrounding fresh water, conducts the majority of electric current. As little as 10 mA of current can cause loss of muscle control which may result in drowning. ESD is a hidden threat because the victim may not be exposed to the stray voltage field when they enter the water. The victim believes that the water is safe for swimming until he or she enters the invisible electric field. Bender Inc. pioneered reliable ground-fault-protection for marinas, boat yards, and docking facilities with the original MarinaGuard, but halted sales in mid-2017 to allow a design update to meet the new standards. MarinaGuard 2 now meets the most stringent standard for the US and Canada to protect against electric shock drowning. By using the updated MarinaGuard 2, marina operators can be certain they comply with NEC 2017 and CEC 2018 to prevent electric shock drowning, and are providing effective protection for every boat user, worker, or houseboat resident. It is available in two variants; single-channel MG-1.2 and twelve-channel MG-T.2, offering one or 12 powered trip outputs to control shunt-trip circuit breakers. MarinaGuard 2 is factory configured for 30-mA protection, but the value can be decreased for enhanced protection beyond the regulatory requirement or increased for non-NEC-2017 applications. The trip-delay time can be adjusted to minimize de-energized circuits when cascaded protection is used (selective coordination). The electrical panel is housed in a lockable NEMA 4X enclosure that conforms to NEC 555.11. A top-mounted flashing red beacon indicates a ground-fault trip and a front panel push button resets MarinaGuard after a fault has been repaired or disconnected. The units have a green front-panel ‘Ready’ light to show proper operation, and a front panel ‘Test’ push button to verify protection-system operation. The panels provide a continuous readout of leakage current (if any) on a graphical display screen.